Croftville Road Cottages #2. On the Shore of Lake Superior. Cozy and Romantic. 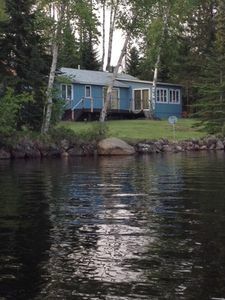 Located 80 feet from Lake Superior’s beach, Cottage #2 provides the gentle sound of breaking waves hitting the shore. There is a spectacular overall open view of Superior amidst small aspens. Only walking paths, natural vegetation, and rocks separate you from the water. A stairway provides easy access to the 540ft of rocky beach. 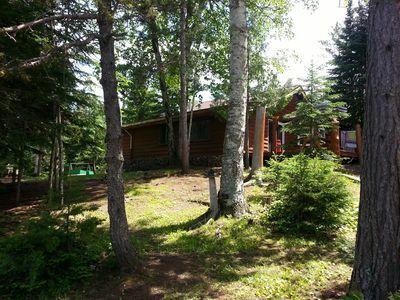 In front of Cottage #2 is a fire circle with comfortable seating and a charcoal grill. 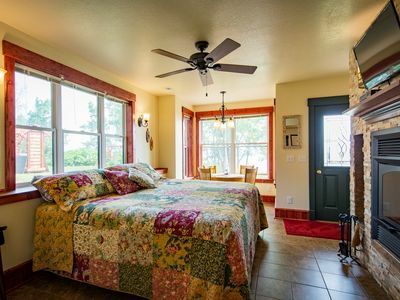 The front bedroom features a queen bed, a romantic gas stove, and a lakeside patio door. 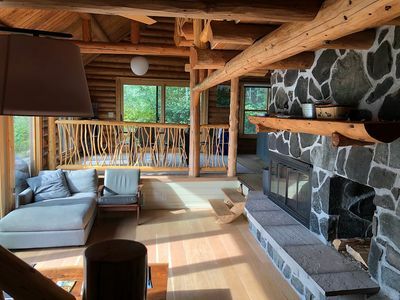 The living room has a decorative gas stove and a picture window looking out upon the lake. 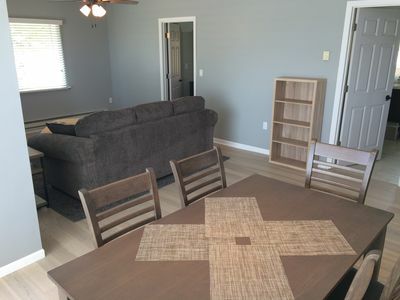 It is furnished with a plush futon, 2 wingback chairs, CD and DVD media players, and a dinette set. 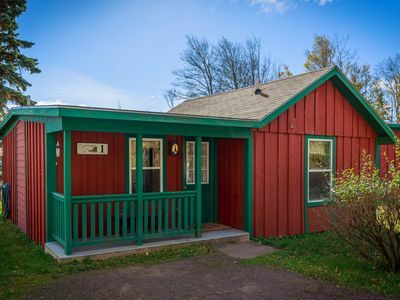 The rear of the cottage has a fully equipped kitchen, a bathroom with a shower, and a bedroom with a full-size bed. 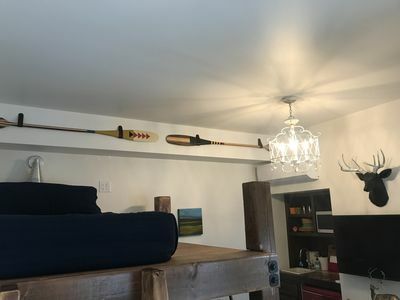 This four-season cottage is open all year, decorated with a moose, bear, and wolf theme, and has wireless internet access. An artesian well provides excellent water for drinking. Cottage #2 sleeps up to 6 people (2 on the futon) with all linens provided. •	Longer stays are better for us as hosts. 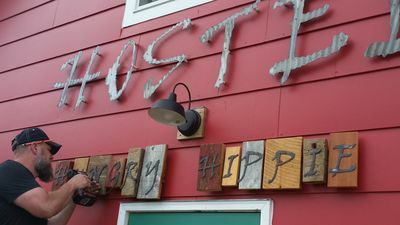 Many hosts simply require 3 night minimum stays. However, we choose to accept 1 or 2 night short stays but charge more for short stays. •	There is a 10% discount available for 3 to 6 night stays. Ask for this discount when making a reservation request and we will send out an edited quote with the discount when you request a 3 to 6 night stay. •	There is a 19% discount for 7 or more night stays. This discounted rate is included in your original quote when you request a 7 or more night stay. •	We have a 2 night minimum stay on weekends and a 3 night minimum stay on holidays and special events. •	We have no cleaning fee. Our cleaning costs are figured into our nightly rates. We do charge for extra guests. •	We are required to collect 12.375% in state and local sales taxes. These show up as lodging taxes on your quote/bill. 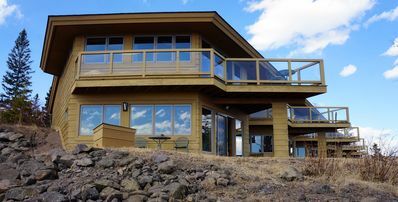 •	As hosts, we pay a 5% commission to HomeAway(VRBO). This has been included in our pricing and will not show up on your quote/bill. 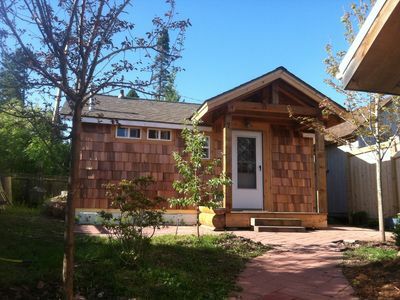 Cottage #2 is one of 8 vacation rentals at Croftville Road Cottages. There are 3 cottages plus the inn with 5 vacation suites, an office, and owners quarters. 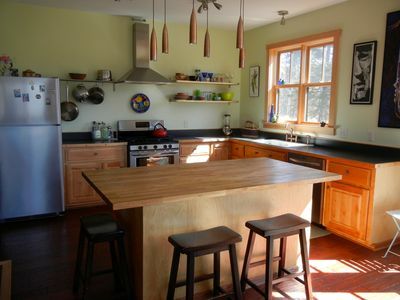 Croftville Road Cottages is owned and operated by Teresa and Mike Chmelik who live on-site. The inviting and romantic cottages and suites are impeccably clean and meticulously maintained. 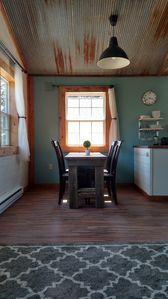 Croftville Road Cottages offers an experience reminiscent of days past when small mom and pop resorts were found all along the North Shore. 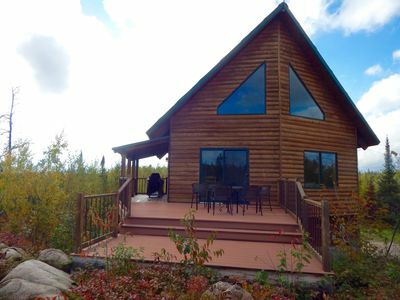 However, the cozy cottages and luxurious inn suites are among the finest vacation rentals along Lake Superior. 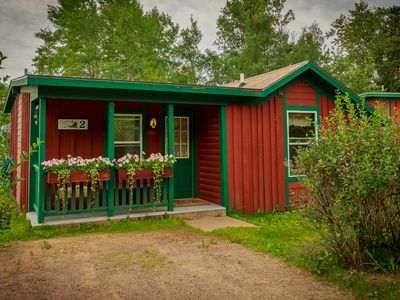 Croftville Road Cottages is conveniently located just 3 miles from downtown Grand Marais on the lakeside of scenic Croftville Road known by locals as the "walking road". Come relax by a fire. Hike along the beach. Enjoy the ever-changing sights and sounds of the lake. Please contact Teresa and Mike with any questions you might have. 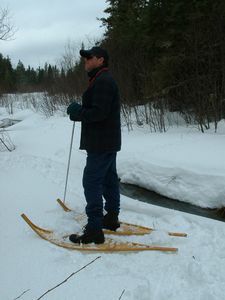 They look forward to your stay winter, spring, summer, or fall at Croftville Road Cottages. 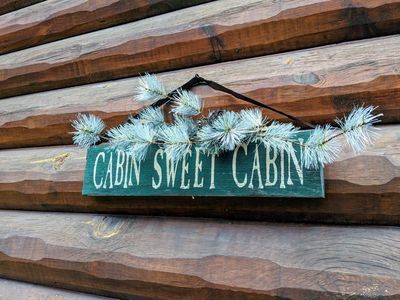 Winter Sale - Stay 2 Nights - 3rd Night FREE! On the Shore of Lake Superior! Winter Sale! Stay 2 Nights - Get 3rd Night FREE! On the Shore of Lake Superior! 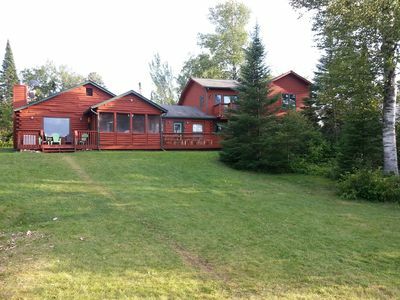 Grand Marais Deviltrack Lake Home new updates! 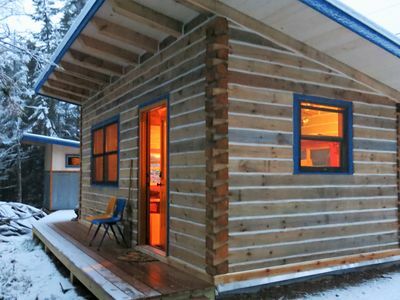 The Writer's Cabin, Affordable And Luxurious, In The Heart Of Town. End Of The Gunflint Trail Looking Over Saganaga Lake. 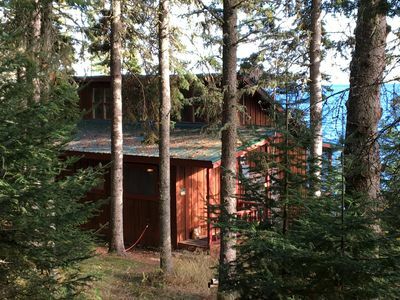 Classic North Shore Lakefront Cabin on Devil Track Lake! Relaxing Required! The Storefront @ The Mayhew Inn - Rooftop Decks, Walk to all restaurants+shops! 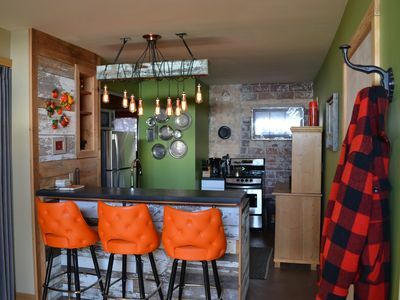 The Plaid Cabin @ The Mayhew Inn - Rooftop Decks, Walk to all restaurants+shops! The Inn at Croftville Road Cottages #6. On the Shore of Lake Superior. Croftville Road Cottages #1. On the Shore of Lake Superior. Cozy and Romantic. Mökki Dwelling by the Dock – "Unplugged"